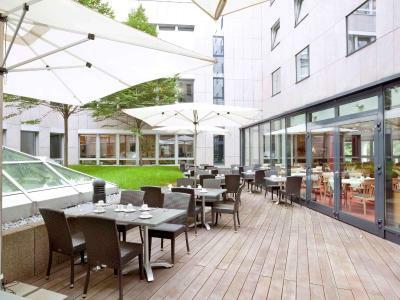 Lock in a great price for Mercure Hotel Seestern Düsseldorf – rated 8.1 by recent guests! large parking garage, at the hotel. Unfortunately at standard costs for 1 day ( euro 15,00 ) hour rate very high 3,00. No discount from the hotel. Very helpful and friendly stuff, spacious room, hotel easy to get to from the airport, nice restaurant. The room is spacious and clean. Breakfast is delicious. I had an issue when I left my phone in the taxi travelling from the airport. The young man in reception called the taxi company and driver and arranged for the phone to be brought back to me. He was friendly, attentive and understood the urgency and importance of the situation. He kept me informed of updates of the situation as I ate in the restaurant. Top class customer service. The only thing worth improving was the quality of warm dishes. Other food was satisfying. Really liked the dairy products (milk, muesli, fruits etc. ), juice, and tea choice. Quiet, large hotel not far off from the centre: 20 mins by U-Bahn from the Central Station, 15 mins from the Old Town. The room is fairly comfortable, soft materaces, kettle, tea, instant coffee. Nice staff on the reception desk. Mercure Hotel Seestern Düsseldorf This rating is a reflection of how the property compares to the industry standard when it comes to price, facilities and services available. It's based on a self-evaluation by the property. Use this rating to help choose your stay! This 4-star hotel in Düsseldorf enjoys a quiet location, a short walk from the River Rhine. It offers modern rooms, a spa and free internet in all areas. All rooms at the Mercure Hotel Seestern Düsseldorf include WiFi, satellite TV and a bathroom with bathtub. A buffet breakfast is available each morning at the Mercure Seestern Düsseldorf. The hotel bar and restaurant 38 serves regional and international dishes. Drinks and snacks can also be enjoyed on the terrace. The Mercure Düsseldorf is steps from the Am Seestern tram stop. This provides fast links to the Old Town which is 2.5 mi away, to the exhibition center and to Düsseldorf Airport which is located 5 mi away. Guests of the Mercure Seestern have access to an external underground car park. When would you like to stay at Mercure Hotel Seestern Düsseldorf? Classic-style room featuring satellite TV, a minibar and a work desk. Classic-style room featuring satellite TV, a mini-bar and a work desk. With tea/coffee maker, complimentary mini-bar and free high-speed internet. With tea/coffee maker, complimentary mini-bar, daily newspaper, bathrobe, slippers and free high-speed internet. House Rules Mercure Hotel Seestern Düsseldorf takes special requests – add in the next step! Mercure Hotel Seestern Düsseldorf accepts these cards and reserves the right to temporarily hold an amount prior to arrival. Ubahn does not travel on Sunday, which goes to the hotel. It's too little on Saturday. The location is perfect for business. Fitness area could have a little bit more equipment (for example pull-up bar). Sauna was very good though. Some stuffs were lazy. The heater didn’t work very well. The breakfast is not cheap, but not variety. The location is not that good if you go back late in the evening, you can not find U-bahn near the hotel because it ended very early. If you have to walk back, the road seems dark and scary for woman alone. The sound insulation is super bad. I can hear a lot of noises from outside every day, including the talks in the corridor, the usage of the bathroom next door and the cars rushing on the highway at midnight. The fridge is full of dust and seems hasn't been opened for years. Anyway, I do not think I will go there again. The hotel looks fancy and the staff is polite. I went here for 15th time, if the hotel was not so good i had chosen another hotel.